[The focus of the present letter is the distinctive value of studying the halachot, the laws of the Torah. The Sages deem these laws to be the "crown of Torah," because the Supernal Will is most fully revealed within the laws of the Oral Torah, inasmuch as they clearly spell out G-d's will with regard to the performance of the mitzvot. In fact, as the Alter Rebbe explains, the Supernal Will as expressed in the mitzvot derives from an even higher level of Divinity than does the Chochmah ("wisdom") of the Torah. Indeed, it is this Divine Will that furnishes the "garments" which enable the soul to absorb the Divine radiance that is manifest in the Garden of Eden]. "A woman of valor is the crown of her husband..."
[This verse in the Book of Mishlei  is a metaphor for the Torah. The Torah is also likened to a wife in another verse:  "See to live your life with the woman whom you love," which our Sages, of blessed memory, explain  to mean the Torah. Here, too, "a woman of valor" refers to the Torah. More specifically, within the Torah itself the Oral Torah is the "wife" and the Written Torah is the "husband". The "woman of valor," which the Alter Rebbe will later explain refers to the halachot of Torah, serves as the "crown" to her husband, the Written Torah]. 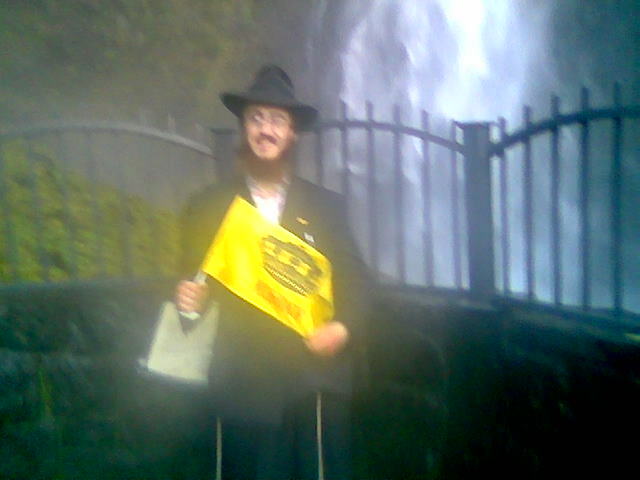 The Gemara, in ch. 4 of Megillah,  [commenting on the teaching of our Sages in Avot  that] "He who makes use of the crown, passes away [from this world]," states: "This applies to him who makes use of one who studies halachot, which are the crown of the Torah..."
[Unlike the text of the Bach, which omits "the crown of the Torah," the Alter Rebbe here accepts the standard printed version as quoted above. [At the conclusion of Tractate Niddah  the text reads, "Whoever studies halachot daily ...." Rashi explains there that the term halachot refers to Mishnah, Beraita, and Halachah L'Moshe MiSinai. In Epistle XXIII (above), the Alter Rebbe (based on Rashi elsewhere ) defines halachot as "clearly adjudicated laws of practical application]." Now it needs to be understood why the halachot are referred to as a "crown" or "the crown of the Torah." Furthermore, why is it that he who studies specifically halachot is assured [of a share in the World to Come], and not other Torah subjects, [such as Scriptures, Midrash and the like]? One also needs to understand the teaching of our Sages, of blessed memory, in ch. 11 of Menachot,  that "even if one studied only a single chapter in the morning [and a single chapter in the evening], he has fulfilled his obligation [to study Torah." The Gemara states there that the individual has fulfilled the commandment that  "this book of the Torah shall not depart from your mouth." According to a second opinion cited later in the Gemara, that this verse does not constitute an obligation, it is to be understood that according to this opinion it is still obligatory to study Torah at all times; however, if one is unable to do so, he can fulfill his obligation by studying a chapter in the morning and a chapter in the evening]. Why is one's duty not fulfilled by other Torah subjects? [The expression "one chapter" indicates that the study is of Mishnah, the Oral Torah. Why can one not fulfill his obligation with the study of Scripture, Midrash and the like]? However, it is well known that R. Isaac Luria, of blessed memory, stated  that [the soul of] every  Jew needs to be reincarnated many times, until he will fulfill all 613 commandments of the Torah in thought, speech and action, [i.e., using all three soul-garments with which one performs the commandments]. This is in order to complete the garments of his soul and to correct them, so that no garment will be incomplete. [As explained in Tanya, ch. 4, the divine soul has three garments - the thought, speech and action of the 613 commandments of the Torah. If the performance of one of these commandments is lacking, the soul's garments are incomplete. It is thus necessary for each soul to perform all of the commandments]. [All Jews are incorporated within the king. When he performs those commandments that depend upon him, it is therefore considered as if all the Jewish people had performed them. As to the other commandments, however, if in one incarnation an individual did not perform them all, he must be reincarnated so that he will be able to do so. Why must one have the garments of all 613 commandments]? The reason is, in order to garb all the 613 aspects and powers of one's soul, so that not one of them - [of these 613 aspects and powers of the soul] - will be lacking. [These 613 "organs" of the soul (see Tanya, ch. 4) must all be clothed in the garments of the mitzvot]. An explanation for the indispensability of these garments is given in the Zohar,  and is understandable by every thinking person. For the Nefesh, Ruach, and Neshamah in man, are created entities, and hence inherently limited, and it is impossible for any created being to attain any apprehension of the blessed Creator and Former of all, Who is infinite. [This, of course, is true with respect to Divinity as it totally transcends all worlds]. Moreover, even after G-d has radiated [a glimmer] of His blessed light, and has caused an emanation in the form of an evolution of numerous [descending] degrees, level beyond level, by way of intense contractions and numerous, immense garments [that obscure G-dliness] - these are familiar to those adept in the Esoteric Wisdom,  and in the Idra Rabba  these [contracted degrees of divine illumination] are referred to as "hairs". [Because the life-force present in hair is so tenuous that it does not even convey sensation, the subtle glimmers of Divine energy that filter through the above-described contractions are referred to metaphorically as "hairs"]. And as is written in Daniel,  "And the hair of His head is like white wool..." [from which we see that certain degrees of spiritual downflow are referred to by the term "hair"] - nevertheless, [even after the screening effected by these mighty contractions], neither the Nefesh nor the Ruach and Neshamah can endure the light. For the light is good and sweet... - [so intensely so, in fact, that no created being can receive it without expiring, as will soon be explained]. It is not in [the soul's] power to absorb the pleasantness and agreeableness of the [above] pleasurable thirst without leaving its husk, i.e., its limitation, and becoming wholly nullified, just like a candle-flame [becomes entirely nullified] in a torch. [Just as the light of a candle loses its identity as an independent luminary once it is confronted by the intense diffusion of a fiery torch, so, too, the soul would cease to exist as an independent entity if it were to absorb the radiation emanating from the intense light and sweetness of G-dliness], were it not that from this very light there will evolve and issue forth some minute radiation, by way of an evolution of level after level, with multitudinous contractions, until a single garment is created of [this contracted light], a creation akin to the nature of this light, with which to garb the Nefesh, Ruach, and Neshamah. By way of this garment, which is akin to this light, [the soul] can derive enjoyment from the ray of this light, and apprehend it, without becoming wholly nullified out of existence. [Since this garment derives from this light, it not only withstands its intensity itself, but also enables the soul to receive the light. Being a created entity, this garment can be "worn" by the soul. And what is this garment? - It is the garment of mitzvot]. This is analogous to someone looking at the sun through a fine and lucid speculum. Thus it is written,  "And Moses entered the midst of the cloud, and he ascended [the mountain]"; that is, he vested himself in the cloud and ascended, and saw by way of the cloud.... [i.e., the cloud served as a garment by means of which Moses was able to receive the revelations on Sinai]. Thus it is explained in the Zohar, Volume II, pp. 210 and 229. 7. See Taz, Yoreh Deah 246:2.
also Shelah, beginning of Torah SheBichtav, p. 264b ff." actual present performance to future certainty. Shulchan Aruch this is a less relevant consideration. commandments of the Sages' about to be discussed. next' (see Tosafot at the beginning of Yevamot). the individual still needs to be reincarnated. Alter Rebbe there uses the term `soul.'" commandments incumbent upon a king." for the king discharges all Jews. 14. Note of the Rebbe: "(So, too, in Torah Or, loc. cit. :) The Alter Rebbe does not mention the High Priest. 15. II, 210b; ibid. 229b. abbreviated in Hebrew to the acronym "chein". 17. Zohar III, 128b ff. 21. Loc. cit., verse 11. 22. Note of the Rebbe: "See Torah Or, Megillat Esther, p.
Torah lessons: Chumash: Chayei Sara, Shlishi with Rashi. Tanya: XXIX. "A woman of (p. 575)...210 and 229. (At this point there appears in the Hebrew text emendations of Torah Or on this week's Sedra, meaningful only in Hebrew. Translator).